Occupation: Student at Beacon Hill Academy year 10. What type of off-road do you race? Motocross. Your machine? Honda CRF 250R. What is your biggest racing achievement to date? As I haven’t been racing long it is coming 9th overall in my 1st race of the new race season 2019 after finishing season 2018 in 18th. What are your future goals? 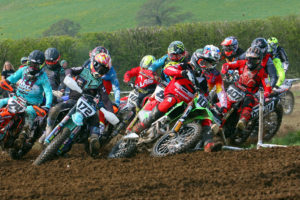 To at least get on to the podium by the end of season 2019, enter into the AMCA championships and any other championships in 2020. Then after this I would like to take my racing worldwide. Where are you racing this season? I will be racing all over the UK. Who is your biggest racing idol? My biggest racing idols are my teammates at Wolvesmx. These are real people! People who I can speak to and learn from and are by my side at every race and push me to do well and achieve my goals. Who is your biggest on the track rival? The person who is in 1st. What’s your pre-race routine? My routine starts with an early night followed by an early wake up with mom’s cooked breakfast, then once at the track I walk the track with my Wolvesmx teammates to visualize my lines and how I will approach the track. Who has been your biggest inspiration? My biggest inspiration has to be Connor Newell as he started just like me at the bottom of the pack and is now very much leading in the AMCA. Whose the biggest goon you race with? I would have to say my good friend KC Grant he is the Biggest joker I know but he is like a Brother to me.